The tweet, which did not provide context for the list, asked viewers if they spotted the Easter egg. Likely because “Assassinate President Trump” is the first thing one reads scrolling down, many Twitter users were not amused, some of them threatening to contact the Secret Service. 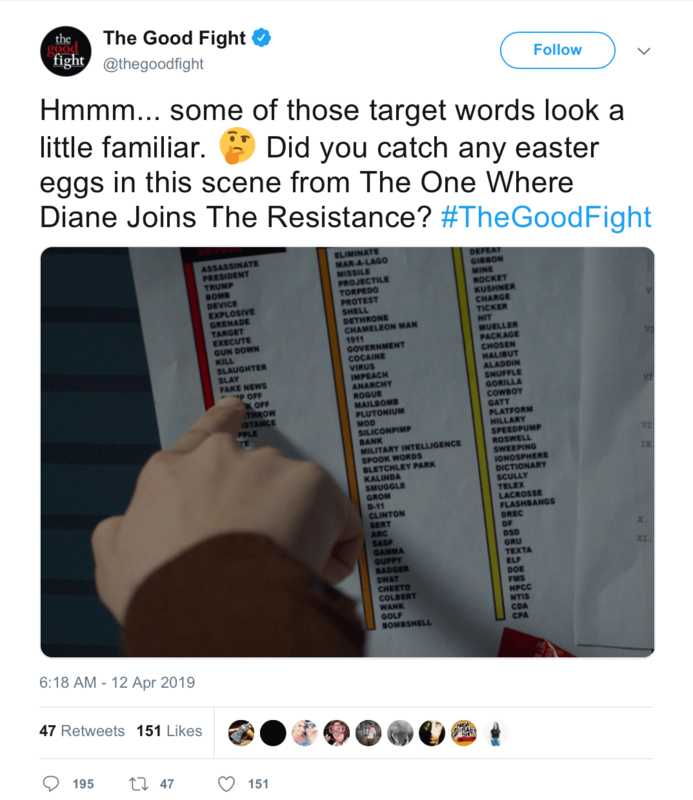 In fact, we’ve learned that the Easter egg reference was to Kalinda, a popular character from The Good Wife, whose name is in the second column. The tweet has since been deleted. Here is the context. The episode that contained the image revolved around Diane (Christine Baranski) joining a female resistance group focused on dragging down President Trump’s approval ratings. Her phone communications with members of the group were intercepted by the NSA analysts, Stephen (Michael Urie) and Dev (Maulik Pancholy), fan favorites from The Good Wife. “Diane, she just used five target words in one sentence,” one of the researchers says, before quickly dragging his finger over “Assassinate,” “President” and “Trump”, until it stops at “Fake News”. In the episode, the list takes a second or so of screen time, which explains why it did not get any attention when the episode premiered on March 28. However, the freeze frame of it with the instruction to look for an Easter Egg sent people in the wrong direction. As for why Kalinda was on the list, we hear the joke was that the NSA still has their eyes on her. A social media post for “The Good Fight” displayed show content that, when presented in isolation, outside of the context of the show, created an impression and provoked a reaction that was not intended. The tweet showed a screengrab from the show’s fictional NSA office, including a list of standalone “target words” the series’ NSA characters should look out for while conducting anonymous wire taps in an effort to protect the President and the public. However, the tweet was regrettably posted without that context, in an effort to direct fans to find an “Easter Egg” clue, in reference to a past character on “The Good Wife,” Kalinda, listed in the second column of the list, and the fact that the NSA is still monitoring her in the fictional world of the show. The post was perceived very differently than the intended result and has since been removed.